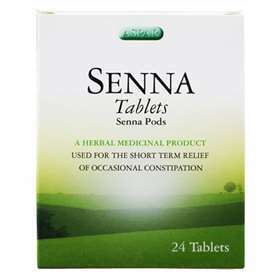 Senna Tablets - a herbal remedy traditionally used for the relief of occasional constipation. Senna tablets works by speeding up the passing of food through the digestive system, preventing water form being re-absorbed into the body and thus keeping stools softer. Adults- 2 tablets at bedtime as required. Children over 12 years old- 1 tablet in the night as required. Safe to use during pregnancy and breast-feeding. Alexandrian Senna Fruit (Pods) (Cassia senna L. (C. acutifolia Delile) fruit)) corresponding to 7.5mg hydroxyanthracene glycosides, calculated as Sennoside B.